Kathryn Flynn is a health educator and a writer specializing in nutrition. She has worked in high school health education, plant-based nutrition counseling, yoga instruction, public health promotion and childhood obesity prevention. Flynn holds a Master of Public Health and is a certified plant-based nutritionist, holistic health coach and yoga instructor. The glycemic index is a measurement of how quickly a certain food will raise your blood sugar. It is based on the amount of glucose in the food, because that is the carbohydrate most readily available and the fastest to have an impact on blood sugar levels. Eating too much high glycemic index food can contribute to heart disease, diabetes and obesity. 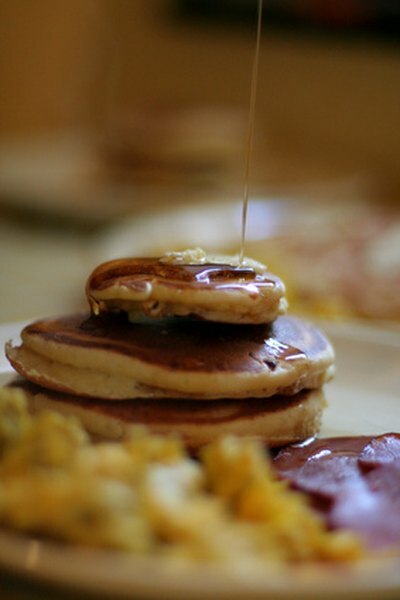 Maple syrup has a medium glycemic index, and should be consumed in moderation. Foods are ranked as having a low glycemic index if they measure 55 or lower. Medium glycemic index foods range from 56 to 69, and high glycemic index foods are ranked at 70 or above. Pure maple syrup has a glycemic index of 54. Flavored maple syrup has a glycemic index of 68. You probably don't consume maple syrup by the glass, unless you are a character in the movie "Elf." Usually, foods like pancakes or waffles go along with the syrup. These also tend to be foods high on the glycemic index. Most pancake varieties have a glycemic index in the 60s, with pancakes made from coconut flour having a slightly lower ranking at 46. Waffles have a glycemic index of 76. If you are trying to consume foods with a low glycemic index, you might want to replace maple syrup with another sweetener. Agave nectar is a liquid sweetener that can be equally substituted for maple syrup and has a glycemic index ranking between 10 and 19, depending on the variety.